Founded in 1949 as a bulwark against Soviet aggression, the North Atlantic Treaty Organization (NATO) remains the pillar of U.S.-European military cooperation. An expanding bloc of NATO allies has taken on a broad range of missions since the close of the Cold War, many well beyond Europe’s sphere, in countries such as Afghanistan and Libya. In 2019, as the alliance turns seventy, it faces a new set of challenges. Some analysts warn of a Cold War redux, pointing to Russia’s military incursions into Georgia and Ukraine, as well as its efforts to sow political discord in NATO countries. The alliance has responded by reinforcing defenses in Europe, but political rifts between members, some opened by the United States, have thrown NATO’s unity into question. After the demise of the Soviet Union in 1991, Western leaders intensely debated the direction of the transatlantic alliance. President Bill Clinton’s administration favored expanding NATO to both extend its security umbrella to the east and consolidate democratic gains in the former Soviet bloc, while some U.S. officials wished to peel back the Pentagon’s commitments in Europe with the fading of the Soviet threat. European members were also split on the issue. The United Kingdom feared NATO’s expansion would dilute the alliance, while France believed it would give NATO too much influence and hoped to integrate former Soviet states via European institutions. There was also concern about alienating Russia. For the United States, the decision held larger meaning. “[Clinton] considered NATO enlargement a litmus test of whether the U.S. would remain internationally engaged and defeat the isolationist and unilateralist sentiments that were emerging,” wrote Ronald D. Asmus, one of the intellectual architects of NATO expansion, in Opening NATO’s Door. In January 1994, during his first trip to Europe as president, Clinton announced that NATO enlargement was “no longer a question of whether but when and how.” Just days before, alliance leaders approved the launch of Partnership for Peace (PfP), a program designed to strengthen ties with Central and Eastern European countries, including many former Soviet republics such as Georgia, Russia, and Ukraine. Many defense planners felt that a post–Cold War vision for NATO needed to look beyond collective defense—Article V of the North Atlantic Treaty states that “an armed attack against one or more [member states] in Europe or North America shall be considered an attack against them all”—and focus on confronting acute instability outside its membership. “The common denominator of all the new security problems in Europe is that they all lie beyond NATO’s current borders,” said Senator Richard Lugar (R–IN) in a 1993 speech. The common denominator of all the new security problems in Europe is that they all lie beyond NATO's current borders. The breakup of Yugoslavia in the early 1990s and the onset of ethnic conflict tested the alliance on this point almost immediately. What began as a mission to impose a UN-sanctioned no-fly zone over Bosnia and Herzegovina evolved into a bombing campaign on Bosnian Serb forces that many military analysts say was essential to ending the conflict. In April 1994, during Operation Deny Flight, NATO conducted its first combat operations in its forty-year history, shooting down four Bosnian Serb aircraft. NATO is currently pursuing several missions: security assistance in Afghanistan, peacekeeping in Kosovo, maritime security patrols in the Mediterranean, training of Iraqi security forces, support for African Union forces in Somalia, and policing the skies over Eastern Europe. Headquartered in Brussels, NATO is a consensus-based alliance, where decisions must reflect the membership’s unanimous collective will. However, individual states or subgroups of allies may initiate action outside NATO’s auspices. For instance, France, the United Kingdom, and the United States began policing a UN-sanctioned no-fly zone in Libya in early 2011 and, within days, transferred command of the operation to NATO, once Turkish concerns had been allayed. Member states are not required to participate in every NATO operation; Germany and Poland declined to contribute directly to the campaign in Libya. NATO’s military structure comprises two strategic commands: the Supreme Headquarters Allied Powers Europe, located near Mons, Belgium, and the Allied Command Transformation, located in Norfolk, Virginia. The supreme allied commander Europe oversees all NATO military operations and is always a U.S. flag or general officer; U.S. Army General Curtis M. Scaparrotti currently holds this position. Although the alliance has an integrated command, most forces remain under their respective national authorities until NATO operations commence. NATO’s secretary-general, currently Norway’s Jens Stoltenberg, serves a four-year term as chief administrator and international envoy. The North Atlantic Council is the alliance’s principal political body, composed of high-level delegates from each member state. The primary financial contribution made by member states is the cost of deploying their respective armed forces for NATO-led operations. These expenses are not part of the formal NATO budget, which funds alliance infrastructure, including civilian and military headquarters. In 2018, NATO members are estimated to have collectively spent nearly $1 trillion on defense [PDF]. The United States accounted for more than 70 percent of this, up from about half during the Cold War. NATO members have committed to spending 2 percent of their annual gross domestic product (GDP) on defense, but by 2018 just seven out of the twenty-nine members met this threshold: the United States (3.4 percent), Greece (2.2 percent), the United Kingdom (2.2 percent), Estonia (2.1 percent), Poland (2.1 percent), Latvia (2 percent), and Lithuania (2 percent). While U.S. officials have regularly criticized European members for cutting their defense budgets, the administration of President Donald J. Trump has taken an even more assertive approach, suggesting it would reexamine U.S. treaty obligations if the status quo persists. “If your nations do not want to see America moderate its commitment to this alliance, each of your capitals needs to show support for our common defense,” Jim Mattis, then the U.S. defense secretary, told his counterparts in Brussels in February 2017. But some critics questioned NATO’s battlefield cohesion. While allies agreed on the central goals of the mission—the stabilization and reconstruction of Afghanistan—some members restricted their forces from participating in counterinsurgency and other missions, a practice known as “national caveats.” Troops from Canada, the Netherlands, the UK, and the United States saw some of the heaviest fighting and bore the most casualties, stirring resentments among the allies. NATO commanded more than 130,000 troops from more than fifty alliance and partner countries at the height of its commitment in Afghanistan. After thirteen years of war, ISAF completed its mission in December 2014. In 2015, NATO began a noncombat support mission to provide training, funding, and other assistance to the Afghan government. As of early 2019, alliance members and their partners were contributing about seventeen thousand troops to this mission; about half were from the United States. Moscow has viewed NATO’s post–Cold War expansion into Central and Eastern Europe with great concern. Many current and former Russian leaders believe the alliance’s inroads into the former Soviet sphere are a betrayal of alleged U.S. guarantees to not expand eastward after Germany’s reunification in 1990, although some U.S. officials involved in these discussions dispute the pledge. Most Western leaders knew the risks of enlargement. “If there is a long-term danger in keeping NATO as it is, there is immediate danger in changing it too rapidly. Swift expansion of NATO eastward could make a neo-imperialist Russia a self-fulfilling prophecy,” wrote Secretary of State Warren Christopher in the Washington Post in January 1994. Over the years, NATO and Russia took significant steps toward reconciliation, particularly with the signing of the 1997 Founding Act, which established an official forum for bilateral discussions; however, a persistent lack of trust has plagued relations. 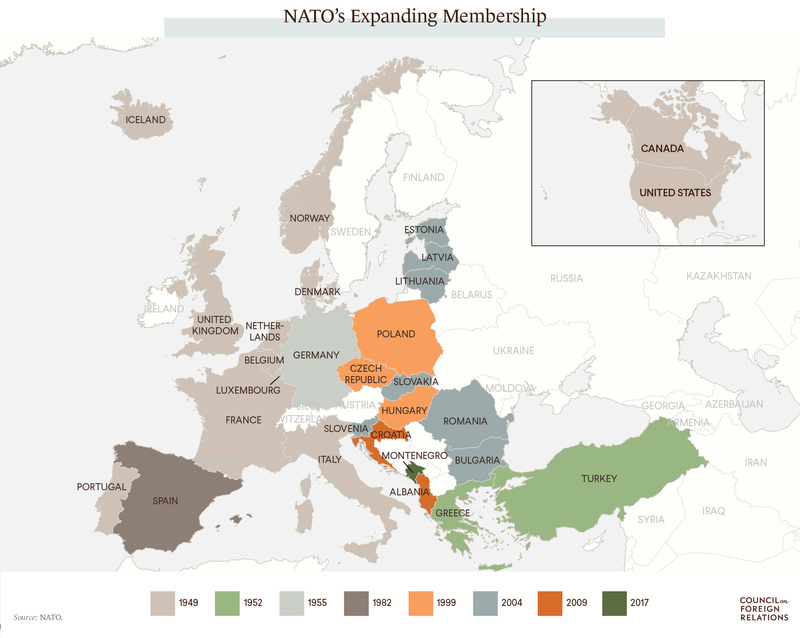 Swift expansion of NATO eastward could make a neo-imperialist Russia a self-fulfilling prophecy. NATO’s Bucharest summit in the spring of 2008 deepened suspicions. While the alliance delayed membership action plans for Georgia and Ukraine, it vowed to support their full membership down the road, despite repeated warnings from Russia of political and military consequences. Russia’s invasion of Georgia that summer was a clear signal of Moscow’s intentions to protect what it sees as its sphere of influence, experts say. Russia’s annexation of Crimea in 2014 and its ongoing destabilization of eastern Ukraine have further spoiled relations with NATO. “We clearly face the gravest threat to European security since the end of the Cold War,” said NATO Secretary-General Anders Fogh Rasmussen after Russia’s intervention, in March 2014. Weeks later, NATO suspended all civilian and military cooperation with Moscow. Another perennial point of contention with Russia has been NATO’s ballistic missile defense shield, which is being deployed across Europe in several phases. The United States, which developed the technology, has said the system is only designed to guard against limited missile attacks, particularly from Iran. However, the Kremlin has said the technology could be updated and could eventually tip the strategic balance toward the West. The military footprints of both NATO and Russia receded dramatically with the close of the Cold War. 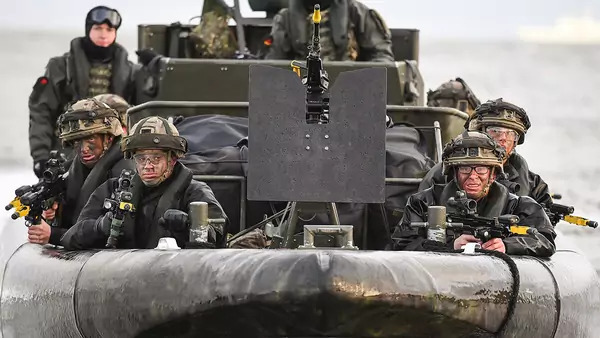 Today, NATO allies in Europe have a slight advantage in ground troop levels, but defense experts warn that Russian forces could still have the edge in a surprise attack. In particular, NATO forces would be “badly outnumbered and outgunned” defending the Baltic countries “in the initial days and weeks of a conventional fight,” wrote analysts in a 2018 report for the RAND Corporation [PDF]. Fears of Russian aggression have prompted alliance leaders to reinforce defenses on NATO’s eastern flank. Since its Wales summit in 2014, NATO has ramped up military exercises and opened new command centers in eight member states: Bulgaria, Estonia, Hungary, Latvia, Lithuania, Poland, Romania, and Slovakia. The modestly staffed outposts are intended to support a new rapid reaction force of about twenty thousand, including five thousand ground troops. NATO military planners say that a multinational force of about forty thousand could be marshaled in a major crisis. In 2017, NATO began rotating four multinational battle groups—about 4,500 troops total—through the Baltic states and Poland. The alliance has also bolstered defenses in the Black Sea region, creating a new multinational force of several thousand in Romania. The U.S. Army added another rotational armored brigade to the two it has in the region, under its European Reassurance Initiative. Meanwhile, NATO has increased air patrols over the Baltics, Montenegro (the newest alliance member), and Poland. NATO routinely scrambles jets to intercept Russian warplanes violating allied airspace. NATO members have also boosted direct security collaboration with Ukraine, an alliance partner since 1994; however, as a nonmember, Ukraine remains outside of NATO’s defense perimeter, and there are clear limits on how far it can be brought into institutional structures. In early 2018, the United States started selling Ukraine advanced defensive weapons, including Javelin anti-tank missiles, to help counter Russia-backed insurgents. Some have called for a reassessment of Turkey’s membership. President Recep Tayyip Erdogan has irked many NATO allies with his efforts to consolidate political power and forge closer ties with Russia, including the acquisition of advanced missile defense systems. NATO began formal accession talks with North Macedonia, formerly known as Macedonia, in 2018. The Balkan nation is expected to become a full member, NATO’s thirtieth, by the end of 2019. This policy brief from the European Leadership Network (PDF) provides a preliminary analysis of the 2015 budget decisions in selected NATO member states. This CFR Backgrounder surveys Russia's military buildup and the potential consequences for Eurasian security and politics. This video from NATO Review magazine examines the roots of the current friction between Russia and the alliance. In Opening NATO's Door, Ronald D. Asmus bears witness to the politics behind alliance enlargement after the fall of the Soviet Union.